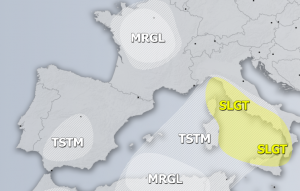 The cutoff low, which produced a severe windstorm over France and numerous thunderstorms across Tuscany yesterday is now moving northeastwards and producing a strong line of thunderstorms over the central Mediterranean. Up to 45 lightning pulses are being observed per minute, very active for so early in the season! Most of the storms are ongoing along the cold front of the system, while some trailing storms are ongoing along the occlusion and under the cold core of the system. Radar scans indicate discrete thunderstorms within the line, likely embedded supercells, given the very favourable conditions. Discrete storms within the convective line over central Mediterranean, as detected by Protezione Civile radar. 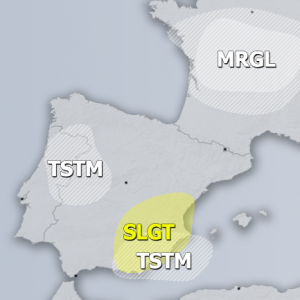 Conditions across the central Mediterranean are highly supportive for organized convective storms. 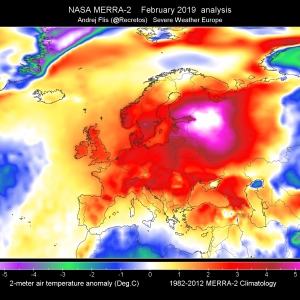 Up to about 1000 J/kg MLCAPE is available, overlapping with 30-50 kt deep layer (0-6 km) shear. Strong QG forcing is also present, enhancing the conditions. Expect the system to move across the central Mediterranean in late morning and early afternoon hours. 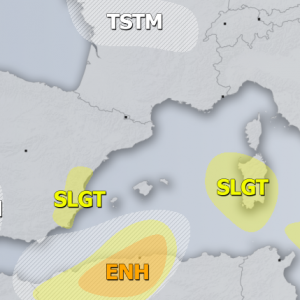 Malta and the western coastal area of Greece should expect strong thunderstorms. Currently fairly strong surface southeasterlies (15-20 kt) are present ahead of the front along the NW coast of Greece, with temperatures around 15 °C and dewpoints around 11 °C. Strong (30 kt or more) southerlies to southwesterlies are present at 925 mbar level (approx. 750 m height), providing strong low level shear and helicity, conductive for tornadoes. Main threats with this system are severe wind gusts, large hail, torrential rainfall and tornadoes. The area was included in the MDT risk area in today’s Severe Weather Outlook. We will be providing further updates on this impressive system in the afternoon.